Book tee times or packages online with us at Vale da Pinta golf course and get up to 30% discount. The Vale de Pinta Golf Course was designed by Ronald Fream and is a 18 hole course, located between Carvoeiro and Lagoa in the Algarve. The Vale de Pinta Golf Course is very interesting to every golfer as its fairways meander over gentle hills and valleys. 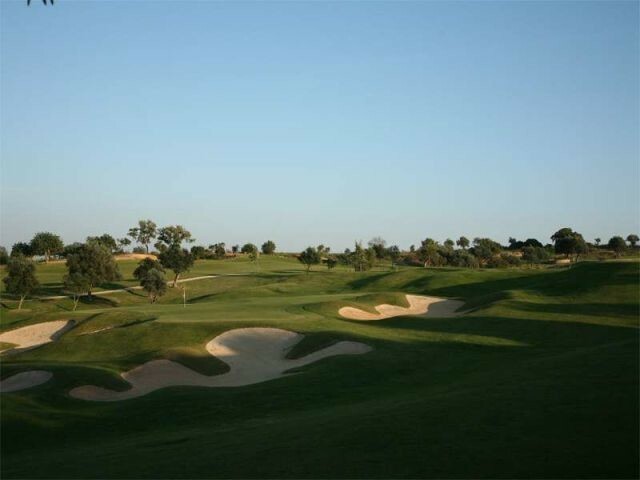 Its backdrop is a truly Algarve landscape with almond, olive and carob trees lining the course. Some of the olive trees are It is reputed locally that some of the olives could be in the region of 1,500 years old! Two holes that deserve special mention are the par-3 tenth and the par-5 thirteenth. The former has a large bunker defending the green, the latter, winds through a valley for 541 metres. A good challenge for golfers with exciting features provided by well-positioned bunkers and two ornamental lakes. Greens are specifically matched to the length of the approach shot. The Pinta Golf Course should be seriously considered with its sister course the Gramacho for your Golf Holiday Package.